Lesko Enterprises’ complete involvement in the production process, from the concept of the mold to the packaging of the end product, allows the conservation of valuable time, money, and resources. By doing it all, Lesko Enterprises ensures highest possible quality standards, drastically reduced shipping charges and ease of communication between processes to avoid the possibility of errors. Not only is Lesko Enterprises a plastics manufacturer, we offer a variety of services for your convenience. 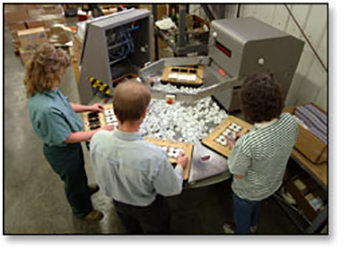 From custom injection molding and full assembly to custom decorating and complete packaging, we do it all. Since we specialize in product customization, we have the skill and knowledge to make recommendations on processes and materials so you can be assured of the highest quality at the best price. No assembly job is too large or too small. Automatic box taping and skid wrapping.